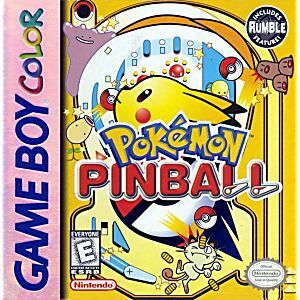 Pokemon Pinball Game Boy Color Game Cartridge Cleaned, Tested, and Guaranteed to Work! I loved this game as a kid and I was excited to find such a good deal on it for my son. It arrived fast and worked perfectly. Thanks! Great game to add to my collection. Great price even with the conversion. Works great thanks. Game came in mint shape. I've already put several hours into it. Love it!! This pokemon game is a lot of fun and very complex for a game of its time. The shape it came in was outstanding and it even had the battery cover for the rumble pack. I would highly recommend buying this game from Lukie Games! As there are many "SCAMMER" websites out there i decided to give Lukie Games my own little trial run. To assure myself whether or not Lukie Games was safe i decided to use Pokemon Pinball (Extremely Cheap for a Collector of Pokemon Like myself) as my first order seeing as how it only cost around 5 bucks + the very low shipping cost. I was Extremely pleased when my game arrived Before the expected date and the product worked flawlessly this has assured that i will be purchasing More Products From this company! I play this on my Super Gameboy and its certainly sparks some memories. Tip: Hold Up & Right, Start and Select to start a new game. Recommended for Pokemon fans, Collectors, Pinball Fans. This game is definitly worth it. I played this as a little kid and it is still as enteraining as it was then. Also I got it in great condition. Gotta catch 'em all, pinball style! A fun addicting little game to play when you want to kill some time. Can be aggravating at times! But overall a great game with great tunes that will be stuck in your head for days! Pretty fun. 'Great for the price. But nothing beats Pokemon Yellow, Gold, Crystal and Silver which are on the same console. I've had this game since it first came out and still enjoy playing it. It can get a little frustrating at times, but it's definitely fun to try to catch 'em all and get to the bonus stages. When I first popped this into my Game Boy, I was shocked at how I just couldn't put it down. This game gives you two boards for the pinball game we all know and love, but based on Pokemon. This means you'll be given the chance to capture Pokemon if you hit certain targets on the stage. Along with that, you also have bonus areas you can access to get the highest score possible. Though this is a little difficult (may be a bit too hard for its intended target audience) you get used to it and I was instantly addicted. It may not be the greatest Pokemon game out there, but you'll still feel the need to "catch 'em all"!